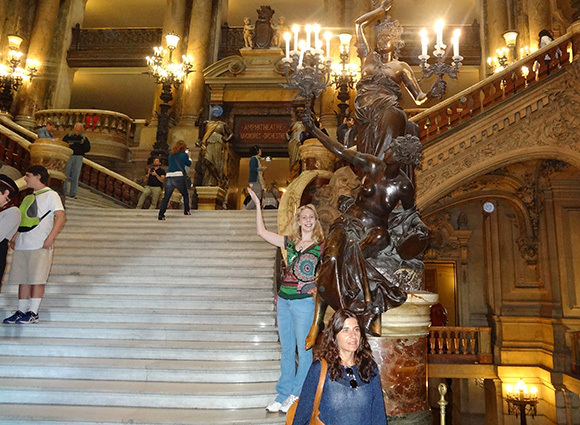 The Palais Garnier is a magnificent building which seats 1979 people and was built between 1861 and 1875 for the Paris Opera. The architecture is in the Baroque style and designed by Charles Garnier who won the opportunity to design the new Opera House in a competition, (the project was designed by Napoleon III). It is situated at 8 rue Scribe, Place de l’Opera a stroll away from the Louvre and it’s ranked 4th out of 752 places to visit by tripadvisor. The interior is as stunning as the exterior complimented by its spectacular gold statues that glinted in the summer sunshine. 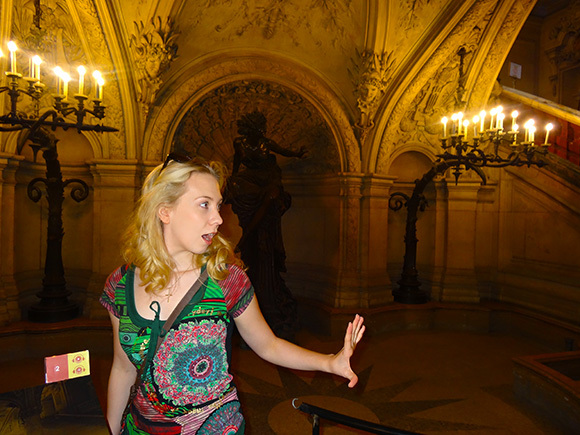 We did a self-guided tour which costed 10 euros for an adult and 6 euros for a student aged 10-25 years. There was an opportunity to be included in a tour party but I prefer to explore at my own pace and and admire all the intricacies with my family. There is a very unusual modern ceiling painting in the theatre itself called the Chagall Ceiling. 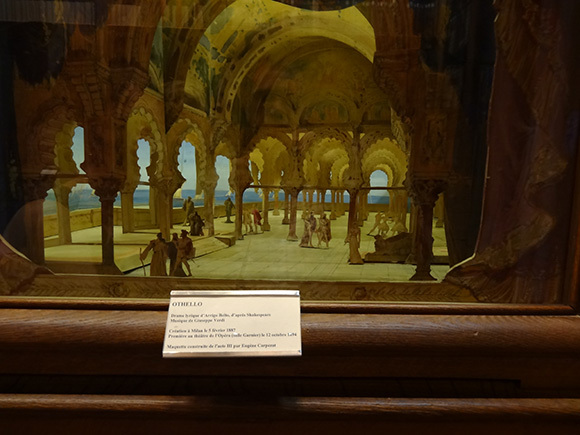 We saw interesting model set designs in display cases and costumes and an outdoor balcony which leads off from the lavish corridors. The opera house is the setting for the romantic Gothic love story “The Phantom Of The Opera” which was written in 1910 by Gaston Leroux. It is said that on his death bed Leroux exclaimed that the opera ghost on which he based his story actually existed. Though there is not a lake under the opera house there is a stone clad water tank that was built to stop the foundations from flooding, but I like to believe that there is a watery labyrinth deep under the opera house. 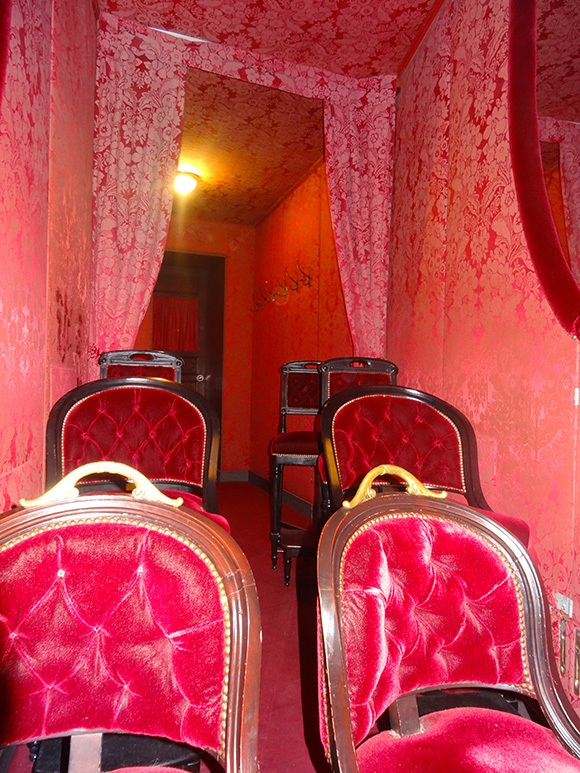 The Phantoms box was box number 5 but we stood at the box with our age on the door and managed to get inside one deep with red velvet furnishings, photographs just don’t do the place justice. Most operas are now performed in the more modern Opera Bastille which seats 2700 and was opened in 1989 but I do hope that they keep performing opera as well as ballet productions in this beautiful building for many years to come. I must admit that looking a little closer at the legends surrounding the Opera Garnier felt a little like searching for Father Christmas. I am a romantic at heart and I like to imagine that the rumours surrounding the story of “The Phantom Of The Opera” were real and that the world of opera and romance continue to be entwined within this beautiful building. I checked out several websites and as my French is not good enough to understand the original Parisian sources I can only relate the information that I found. There is an underground “lake” beneath the opera house but unfortunately it is not the mysterious underground labyrinth that I had imagined. It is rather the result of the Architect’s imagination, Charles Garnier, who encountered high levels of ground water on the site. He tried using wells and steam pumps to drain the foundations but failed to dry out the site. So instead he decided to use the water and by building a large stone tank called a “cuve” to collect the water he was able to add extra stability to the foundations of the grand building. After completion the large tank provided the Paris fire department with a ready supply of water in the case of fire and is still checked every month by fire fighters. On May 20th 1896 an incident occurred in the Opera Garnier which could have inspired Leroux when reseraching for his story. At 8:57 pm during a performance of “Helle” two counterweights fell from the chandelier which led to the death of one audience member and injured many others. There is an excellent blog post here if you want to read about the incident which I found fascinating. It also explains why there was so much controversy over the final repair and repainting of the ceiling surrounding the original chandelier. 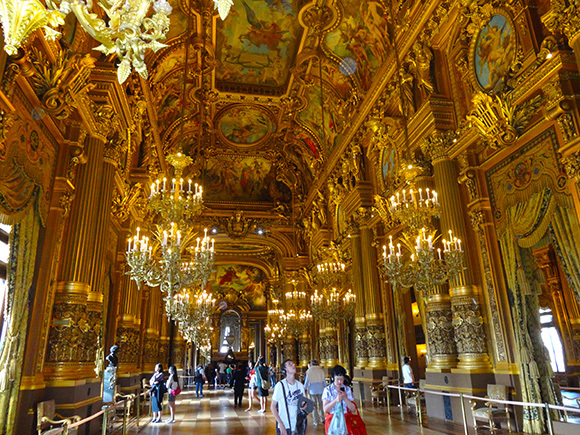 I really enjoyed reading a little deeper into the history of the Opera Garnier but just like Father Christmas maybe some things are best left to our imaginations. Thanks for sharing these pictures and the explanations. You are amazing! I enjoyed sharing our photos, thank you. The way you observe life around you makes me want to visit the places you so graciously share. Thank you for this tour of a truly enchanting treasure! Can hardly wait for photos of YOU on their stage, performing. Great photos. Great tour. Only one question left. Did you meet the Phantom? If I ran the tours there’d be a ghostly phantom actor, some of the stairwells are dark and mysterious. What a sumptuous place. Thank-you so much for the tour. I’d love to see more, behind the curtain, into the cellars, the changing rooms, the chained off staircases :). It was nice of you to say the ‘intricacies with your family’ and not ‘of your family’. I enjoyed the Leroux novel, but it didn’t have any Charlotte parts, so…. Haha we’re all very curious people lol. I’ve seen the outside on several occasions but never toured it. Maybe the next time I’m in Paris I’ll be able to go inside- it looks lovely. It was very busy, most days tour buses pulled up outside and on the day we visited the guided torus were very busy. It’s great to see so many people interested in the opera house and perhaps some of the opera houses that are struggling for funds should consider this during their summer closed season. So did I. I will be studying Baroque singing this year and I will be able to imagine the setting clearly. OMG I love that box!! I want to take pics in there something awful LOL. Looks like a wonderful visit, thanks for sharing the photos! You would love it, so many great things to photograph inside and outside from door handles to mosaics on the floors. It’s funny what each of us found interesting to photograph. Tom kept seeing carved faces in the stone blocks around Paris and took photographs whenever he saw them. Very nice. Thank you Charlotte. Thank you for creating my concert poster, glad you liked me photos of the Opera House. There’s a picture of the underground lake. The water table was very high when it was first built. 8 solid months of pumping the lake dry !!!! The stage works on a water hydrolic system so the underground lake proved very useful. In 1896 I believe the chandelier did fall down during a performance given by the singer Rose Caron. of my post with some links to the information if anybody wants to read more. Fantastic tour of the place!!! I would love to be a tour guide in there, I’d just want to sing to everyone and make up ghost stories. I sat in the upper slips with my mother for Rigoletto in the 1960s and in the 1990’s with my husband and friends for Faust, we also went to a Magic Flute in the Bastille. Wonderful experiences. 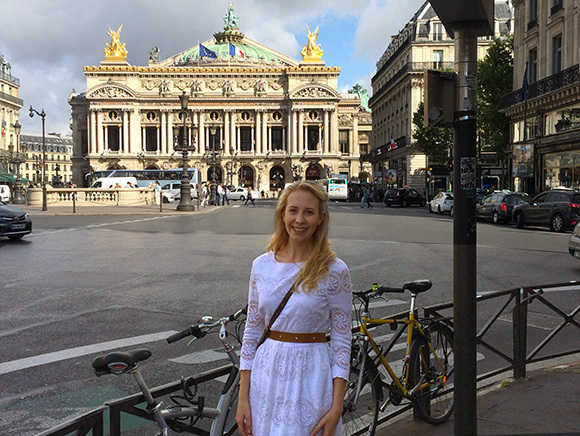 I stood outside the Paris Opera and wanted so badly to see an Opera, but it was not the season. Your photos inspire me. What a magnificent building. Thank you for stopping by my kitchen. I love opera. Such a regal place, amazing ~ and also regal writing & photos 🙂 Cheers to a great weekend for you! Fantastic, do they keep horses there or were they for visiting horse and carriages?